As we have since July 2006, each Friday we’ll post our sampling of cigar news and other items of interest from the week. Below is our latest, which is the 560th in the series. 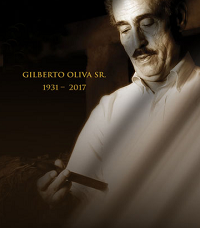 1) Surrounded by family in Miami, the patriarch of Oliva Cigar, Gilberto Oliva Sr., passed away on Saturday. He was 86. Oliva was born into a tobacco-growing family in Cuba and married there before fleeing the island in his early thirties to escape the Cuban Revolution. He lived in Spain, Nicaragua, and New Jersey before settling in Florida. His first cigar—called Gilberto Oliva—debuted in 1995 and was made by the Plasencias. Shortly thereafter, he launched his own factory in Nicaragua and shortened the brand name to Oliva. Gilberto is succeeded by his wife, five children (including future Florida House Speaker Jose Oliva), and fourteen grandchildren. In 2016, the Oliva family sold Oliva Cigar to a Belgian cigar maker, J. Cortès, for an undisclosed price. 2) U.S. Senator Lindsay Graham (R-SC) has signed on as a co-sponsor to S. 294, a bill that would amend the Federal Food, Drug, and Cosmetic Act to exempt premium cigars from harmful FDA regulations. He is the 19th senator to do so. “CRA and the entire premium cigar industry would like to thank Senator Graham for standing with the consumers and small businesses of the premium cigar industry,” reads an email update from Cigar Rights of America. A companion bill in the House of Representatives, H.R. 564, currently has 139 co-sponsors, according to Congress.gov. 3) Lists like this one are frequently full of over-hyped offerings, but this gift guide actually has some pretty good suggestions: 15 bottles that make perfect gifts for whiskey lovers. 4) Inside the Industry: This week CigarAficionado released its top ten cigars of 2017. Number one is the extremely hard-to-find Arturo Fuente Don Carlos Eye of the Shark. Retailers (who usually report a boost in sales for the top selection) are already grumbling about such a limited production cigar being chosen. 5) From the Archives: Next week we’ll release our top cigars of 2017. While you wait, check out our 2016 list: part one and part two. 6) Deal of the Week: StogieGuys.com recommends Bespoke Post, a monthly collection of awesome items (think fine bar accessories, hot sauce kits, wine, workout gear, exclusive cigars, and more) delivered for just $45. Once you are signed up there is no obligation; you can skip or purchase every month. Sign up here to be eligible for the January box; including the “Churchill” box that features four cigars, an ashtray made of reclaimed wood, an odor-eating candle, cedar spills, and a cutter.